The music venue and restaurant complex in Irving opened about two months ago. Everybody has to take back those headlines comparing Irving to Deep Ellum. Big Beat Dallas, billed as a key part of the suburb’s plans to cop some of the Dallas neighborhood’s reputation as a live music hotspot, is closing. The complex, five bars and restaurants surrounding an outdoor stage and plaza packaged as part of the larger Toyota Music Factory development, had been open for barely two months. 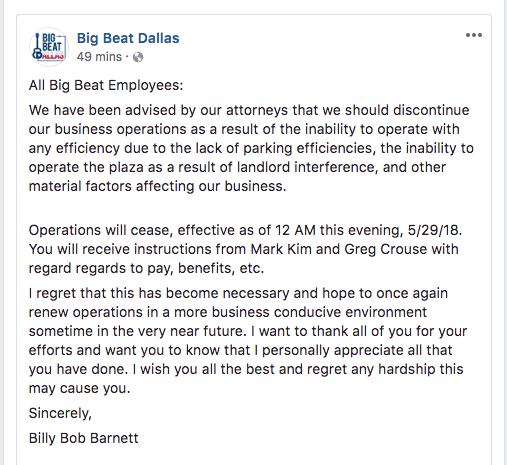 An explanation of sorts comes from a since-deleted Facebook post that should prove frustrating to anybody looking to understand why Big Beat Dallas is closing, and to the Big Beat Dallas employees now out of a job. The post is signed by Big Beat Dallas owner Billy Bob Barnett, founder of Fort Worth honky tonk Billy Bob’s. It’s otherwise business as usual at the Toyota Music Factory, anchored by the Live Nation-operated Pavilion and rounded out by other restaurants and venues, including an Alamo Drafthouse outpost. I’ve left messages with Big Beat Dallas, the Toyota Music Factory, and Restaurants Unlimited, a Seattle-based outfit that had a hand in Big Beat Dallas. I’ll update here if I hear back. Update: I did get through to Noah Lazes, president of the ARK group, the Music Factory’s developer and landlord. He says he was as “shocked as anyone” about Barnett’s announcement that Big Beat Dallas was closing. “On the surface it looked like Billy’s concept was doing well,” Lazes says. The 4,200 parking spaces provided by the complex should be plenty of parking for visitors, and Lazes says he’s not sure what Barnett meant by citing “landlord interference” as a reason for the closure. The Music Factory itself apparently had more than 30,000 visitors over Memorial Day weekend, and Live Nation’s Pavilion at the development has been busy with high-profile concerts since its opening last year. Lazes says he expects that Restaurants Unlimited, the Seattle-based restaurant operator that went in on Big Beat Dallas with Barnett and acted as the guarantor, will “reactivate” the five closed restaurants included in the complex. If not, Lazes says he’s already fielded calls today from interested renters. Lazes also expects the plaza’s stage to be back in action soon enough. “The stage we envisioned as a common stage,” Lazes says. “We didn’t envision as many shows as (Barnett) was trying to do out there. That may have been one of his struggles.” Big Beat Dallas’ crowded concert calendar is now defunct.